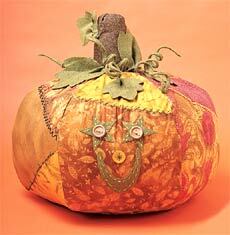 This soft, stuffed pumpkin is a cheerful addition to your autumn and Halloween décor. Feel free to make it in any fabric combination. 1. Enlarge pattern pieces (pumpkin and leaves) 250 percent. 2. From one calico fat quarter, trace and cut out circle for pumpkin bottom. 3. Trace and cut out 6 pumpkin sections from remaining calico fat quarters. If desired, stitch several smaller pieces of calico together in a crazy-quilt style. Embroider as desired. 9. To make vines, cut several 2” x 12” lengths of felt. Fold felt around chenille stem. Stitch close to chenille stem, and trim close to stitching. To make vine curly, twist felt-covered chenille stem around a dowel or marker. Glue vines to top of pumpkin. Please read all instructions prior to beginning; read and follow all manufacturers' instructions for all tools and materials used. Provide adult supervision if children participate in this and all craft projects. Because Jo-Ann Stores, Inc. and joann.com have no control over the use of materials and tools, nor surroundings, during construction of projects, Jo-Ann Stores, Inc. and joann.com disclaim any liability for injury, damage or other untoward results. Content of this project sheet is presented in good faith, but no warranty is given, nor results guaranteed.